Immaculate TIG-Welded 304 stainless steel, beautiful contemporary lines, and cutting edge technology are usually phrases that you would use to describe a new luxury car but today we are talking about something even better. 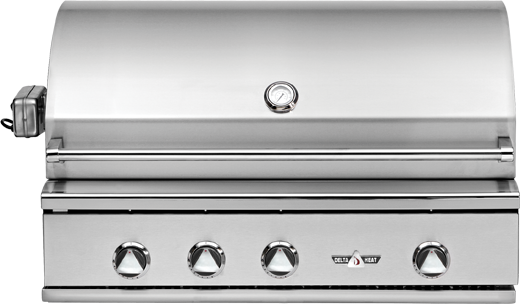 The 2017 Twin Eagles ‘C’ Model Line BBQ debuted on the first of this year with stunning features that have been updated for the first time in eight years. Here at San Diego BBQ, we pride ourselves on having the best barbecues and grills in the industry. The Twin Eagles BBQ has a lifetime warranty and all of the bells and whistles that you could ever want on your dream barbecue. 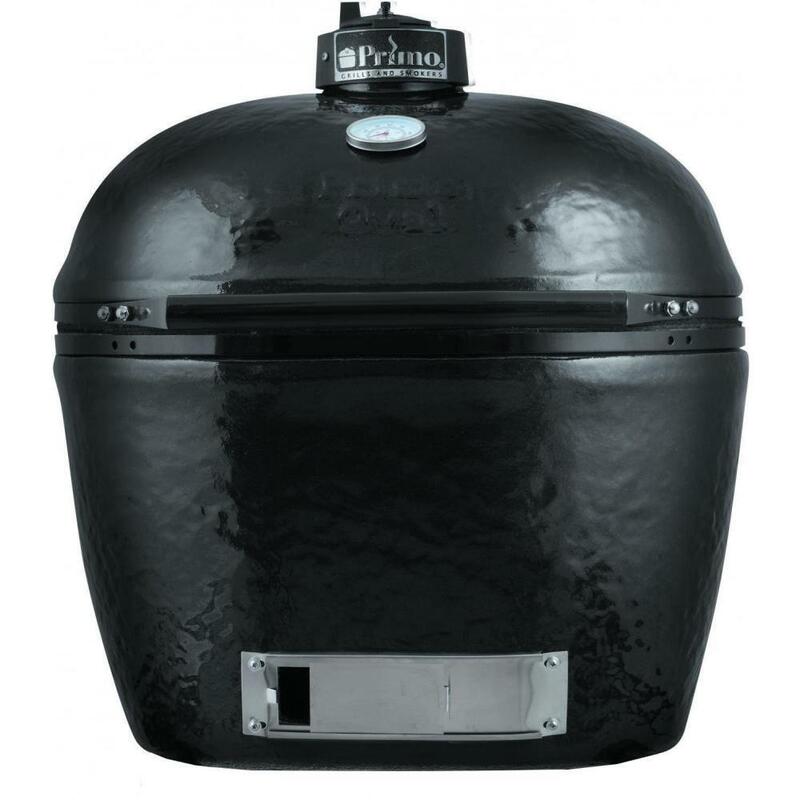 With a smoker box, warming and cooling rack, hot surface ignition, built-in rotisserie feature, “black glass” LED back-lit control knob system and temperature regulated zone dividers you will be able to cook, bbq, grill, or smoke anything your heart desires. Get ready for late night barbecues! 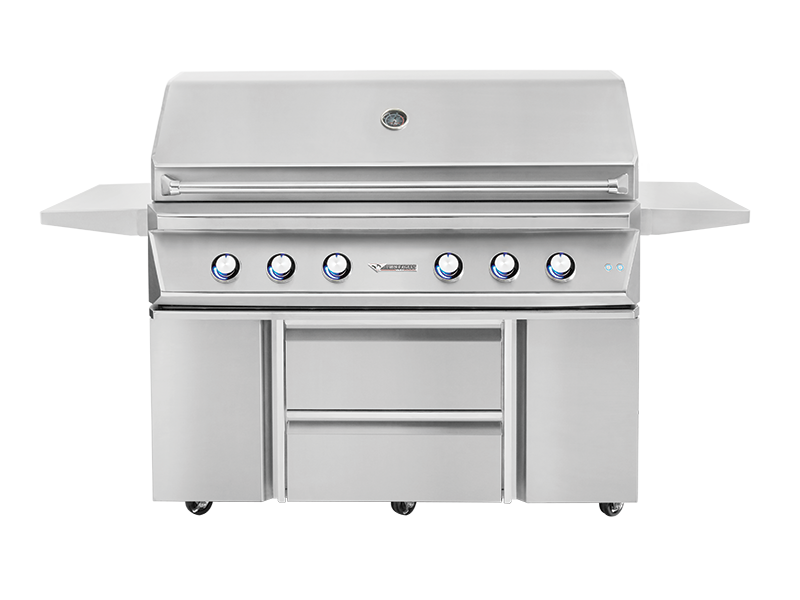 Now you will be able to BBQ after work with Twin Eagles dual interior halogen lighting and blue & white “floating” LED temperature variation on the knobs via a cutting-edge hood activated switch. Lighting is no longer a constraint when it comes to grilling in the backyard. 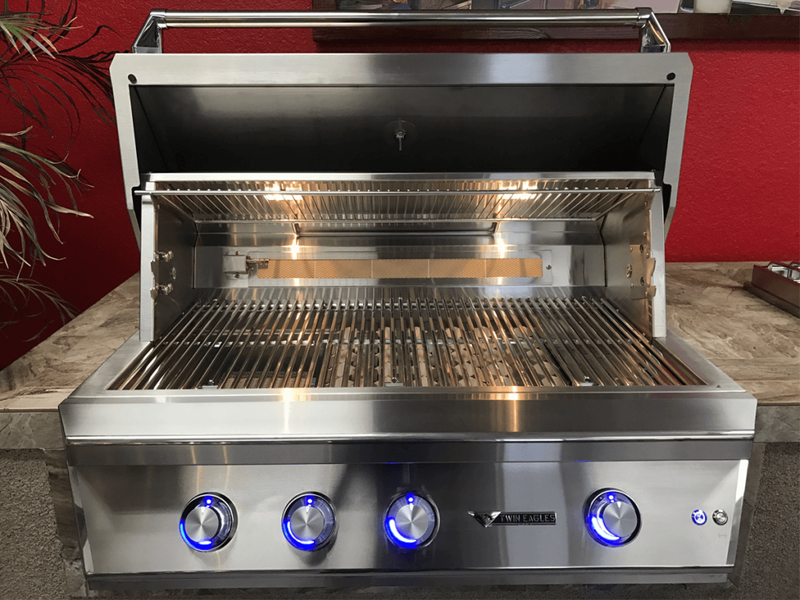 This new Twin Eagles grill in San Diego has control illumination that will give you the ability to precisely control your luxurious BBQ with elegant knob settings. The easy to open hood assist system even helps prevent unwanted food spills or accidents, making the 2″ thick double-walled solid stainless steel hood feel light enough to lift with one finger. Let’s talk about the advanced technology, engineering, and design that makes barbecuing on this grill precise, pleasurable, and effective. This BBQ for sale in San Diego has revolutionary hexagonal grates that are specifically designed to create a maximum surface to food contact for even cooking. 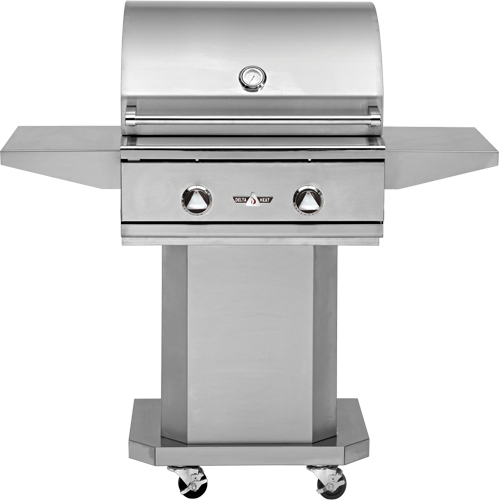 The beautifully constructed Twin Eagles BBQ is not only designed for style but is also built with American made ceramic briquettes, 25,000 BTU stainless steel burners, has 14 gauge 304 stainless steel and sleek lines that will complement the look of any home. The patented “drafting” system provides the most even heating available on the market today! As your one stop shop for built-in BBQs for sale in San Diego, it’s time for you to purchase the new Twin Eagles BBQ in celebration of the Super Bowl outcome or as a gift to cheer you up from the disappointments of a loss. Call us today and we will install your new barbecue grill just in time for March Madness and with enough time to perfect your BBQ recipes before those summer months. 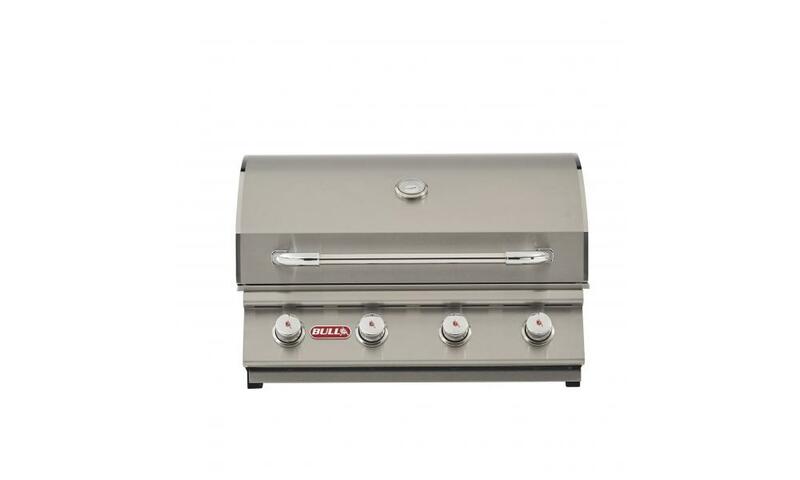 Smoke, grill, and char your way to happiness with one of our BBQs for sale in San Diego. Trust us your stomach, family, and friends will all thank you!